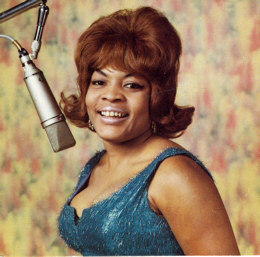 Ruby was born on 19 April 1936 in Elizabeth City near Norfolk VA but made most of her recordings in Washington DC, even though it is through her later sessions for Stax that she is perhaps best known. After gigging around the Carolinas she settled in the capital city where she was spotted by DC entrepreneur Never Duncan who hired the multi-talented Dicky Williams as arranger/producer for her 45s. 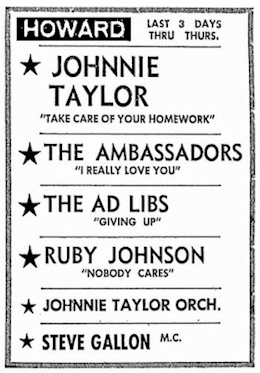 The first was leased out to V-Tone and from her hard, husk swinging R & B tones on this fine two sider from 1960 you’d never have guessed she was brought up in the Jewish faith! It seems likely that the Pledge 45 was her second disc, maybe a year or more later, and Stop Wasting Your Tears is her first attempt at a blues ballad – and pretty successful it is too. 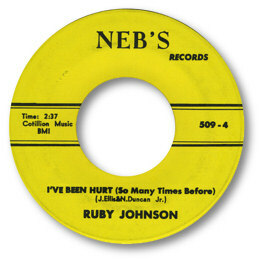 But it is via her excellent series of 45s for Neb’s (Duncan’s own label) that she made her considerable reputation. There’s not a bad single amongst them – but in my view here considerable vocal abilities were best suited to ballads when she was able to wring great emotional depth from even a trite or conventional lyric. Amongst the pick of these is the downbeat “Let Me Apologize” with its stirring horn chart, the splendid “I Want A Real Man” on which she positively screams her frustrations and “Here I Go Again” with her voice cracking over some fine harmonies and a stop/go rhythm. But for me the picks of them all are Worried Mind and I’ve Been Hurt (So Many Times Before). Both feature astonishingly mature and frighteningly well timed performances from Ruby and the songs seem just that bit better constructed and arranged. These tracks are up there with the very best of female deep soul of the period. Simply wonderful. The latter song is quite similar in its approach to the songs she cut for Stax for whom she signed in 1965, with its fine horn charts and tricky rhythm. Her three singles for the company that appeared at the time have been rather disparaged by the writer/producer David Porter – but that is quite unfair to both himself and the quality of the efforts of everybody involved as they are uniformly excellent. If “I’ll Run Your Hurt Away” with it’s pumping piano line and hoarse vocal was a marvellous deep ballad, When My Love Comes Down was out of this world. To me this is one of the greatest discs that Stax ever put out. From Steve Cropper’s chopped guitar, and Booker T’s subdued organ, to the lovely contrast between the oh so quiet verses and the fierce broken rhythm hook when the horns come blaring in this is music that makes the spine tingle. And when you add a vocal so intense and powerful as Ruby achieves and the terrific chorded finish I don’t think music gets much better than this – if at all. 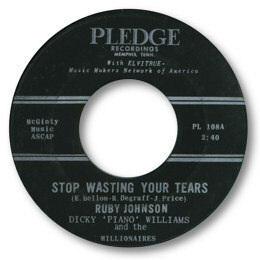 In comparison to this masterpiece “If I Ever Needed Love” – which in other company would be a 5 star ballad – is just another of those bluesy deep songs on which Ruby excelled. Several of her 45s did sell well in the DC area and “Ill Run Your Hurt Away” made the national charts but despite her great talents she never got that big break. Duncan rereleased one of the Neb’s 45s on Cap City and took Ruby to record in New York but no more records ever came out sadly. She left the business altogether in 1974 to work with handicapped children in Maryland, a very worthy cause. But the kids gain is our loss. 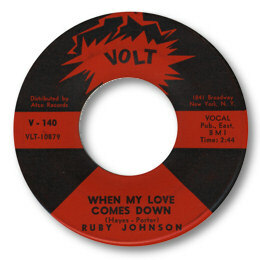 If you ever want to know why soul music means so much to me just listen to the emotional effects that Ruby Johnson could achieve. Sadly Ruby passed away on April 19, 1999. Note ~ All of Ruby’s wonderful Stax sessions, including alternate takes and unissued cuts were collected together on the Stax UK CD “I’ll Run Your Hurt Away” (CDCXCD 049). Simply essential listening. Special thanks to John Soul Smith for the handbill.